The frigid cold has arrived, and I need as much help as possible to get me through these dark winter days. Aside from wearing multiple layers, I am also counting on my warm and cozy friend: burgundy. Burgundy is a blend of red and blue hues with a touch of purple thrown in, making it a color that everyone looks great in because it compliments all skin types. Even though it’s a darker shade, it gives you an unexpected pop of color - perfect to get you through the winter. 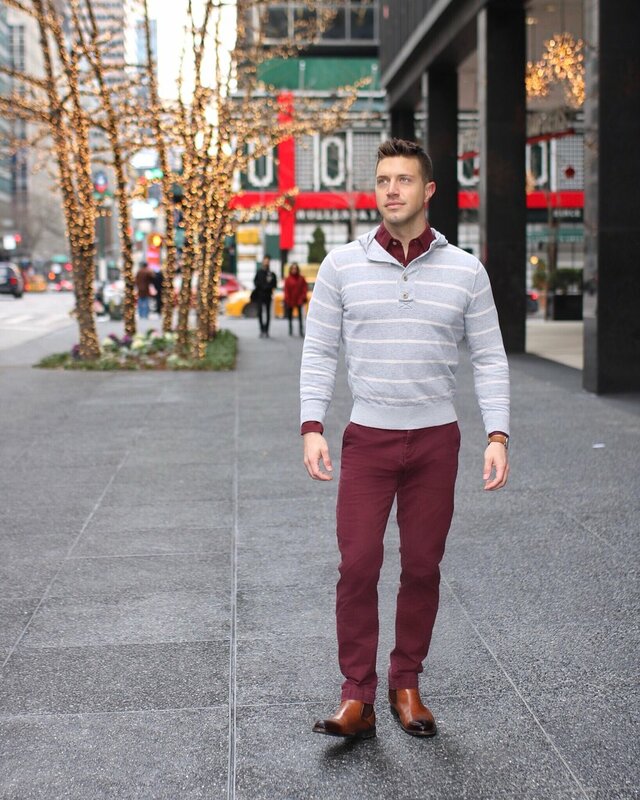 I find that most men who wear burgundy incorporate this color into a top, but I want to share three other powerful ways to make this an even bigger part of your winter wardrobe. Burgundy may not be the most conventional color for pants, but it’s one that opens up your wardrobe to a realm of possibilities. I love buying a piece of clothing that can be worn dozens of different ways because you truly get more bang for your buck. Burgundy pants can be paired with almost every color and every type of top. They instantly make any outfit feel dressier. I love pairing these pants with a fitted sweater layered over a crisp button-down shirt. A lace-up or Chelsea boot is the perfect finishing touch to making a strong statement with your look. I don’t see this color being worn by men as much as I think it should be, and that’s because many people feel intimidated by it. But fear not, with these pants, the options are endless and you will stand out for all the right reasons. Whether you wear a suit for work, social gatherings, or special occasions, there is no better time to make a statement. While I love my navy, black and grey suits, I sometimes get tired of wearing the same color palette. This winter, spice up your suiting with burgundy. I gravitate towards textured suits because they add an extra element of style and show that you put thought into your suiting. During the winter months, play with different fabrics and textures like wool, tweed, cashmere, and herringbone. This burgundy suit is made from wool and has a faint speckled pattern. You always want to feel good when wearing a suit and this fashion-forward look will leave you feeling like the most confident one in the room. Just be sure to stick with more neutral shirts colors like white or light blues because the suit already makes such a strong statement on its own, and you want that to be the focus of your look. Never underestimate the power of footwear and accessories. Burgundy shoes go with dark denim and most colors of chinos or dress pants. You can be wearing the simplest outfit and make it look like a million bucks, just because you have on a show-stopping pair of shoes. By wearing a color outside of the box, you instantly have a fashion-forward look. I always say that if you’re a bit trepidatious about trying out a new color like burgundy, start with the footwear first to break yourself in. If you’re ready to take a bigger plunge, switch out your work bag every once in a while with a different color. This burgundy bag gives a pop to your standard suit and adds a little extra flavor to your look. I look forward to seeing how you style your burgundy this season!